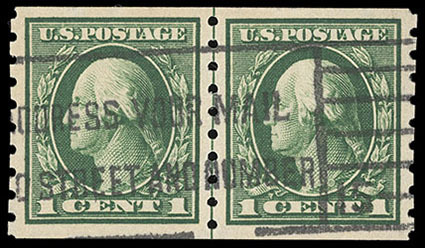 1912, 1¢ green, horizontal coil, line pair, slogan machine cancel, exceptional centering, rich deep color, Extremely Fine to Superb, a rare used line pair in gem condition, this being one of two examples to receive this grade with only one higher (at 98); with 2003 & 2004 P.S.E. certificates, the latter Graded (XF-Sup 95, SMQ $600). 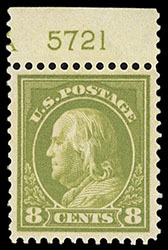 1912, 8¢ pale olive green, top margin plate number "5721" single, o.g., never hinged, rich deep color, exceptional centering amid well balanced margins, Extremely Fine to Superb; with 2003 P.S.E. & 2015 P.F. certificates, the latter Graded (XF-S 95, SMQ $525). 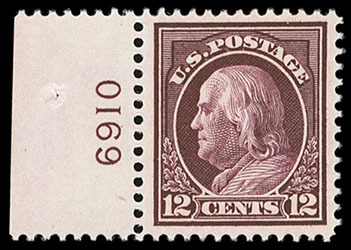 1914, 12¢ claret brown, left margin plate number "6910" single, o.g., never hinged, rich deep color on bright fresh paper, choice centering with well balanced margins, Extremely Fine. 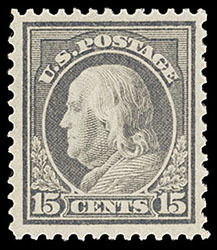 1912, 15¢ gray, o.g., never hinged, choice centering and margins, strong color on bright paper, Extremely Fine; with photocopy of 1999 P.F. certificate for block. 1914, 50¢ violet, S.L. watermark, left plate no. "7040" block of six, bright shade, F.-V.F. 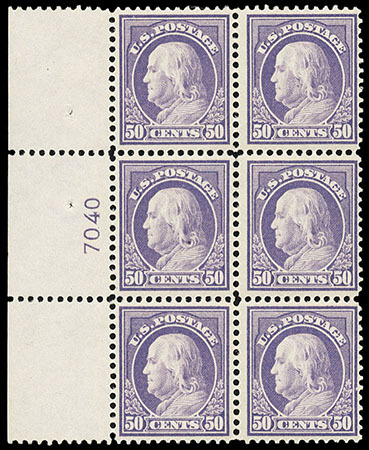 THE 50-CENT PERF 12 WITH SINGLE-LINE WATERMARK IS EXCEEDINGLY RARE IN PLATE BLOCK FORM. 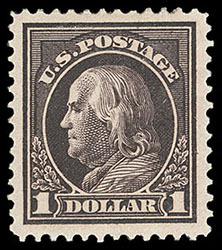 1912, $1 violet brown, o.g., very lightly hinged, well centered amid wide margins, rich deep color, Very Fine and choice; with 1993 P.S.E. certificate.